Basic Information: What is Hair Formula 37? 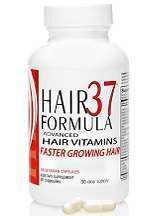 This review for Hair Formula 37 has been written keeping mind the prospective customers who want a reliable hair supplement that can take care of the requirements that are necessary for the growth of hair. This supplement has been prepared by a chemistry expert who knows how the combination of certain vitamins and minerals helps in promoting growth of hair making them longer and stronger. This product is available on its website as well as on other shopping websites. One should take one tablet in the morning with breakfast and one in the evening with dinner that makes it two tablets a day. One should keep in mind to eat something while taking these tablets. There are several options that are given to a customer. A 30 day supply is priced at $24.99, while two bottles are priced at $39.99, three bottles are priced at $58.50, four bottles are priced at $75.96, five bottles are priced at $89.95 and six bottles are priced at $104.99. When I started taking these supplement I noticed an improvement not only in my hair but also in my nails and skin. The natural ingredients that are used in this supplement are safe and help in improving the overall condition of the body. My hair is now shinier and stronger with reduced hair fall. I will continue to use this product for the coming months. Since it is made of natural ingredients there are no known side effects however it is recommended that one consults a doctor before taking these supplements. Women who are pregnant as well as those who are nursing should consult their doctor before taking these supplements. The manufacturer gives a 90 days return policy as well as full refund if after using the supplement the customer is not satisfied. One needs to send them back the empty bottles as well as the unused product. In order to be eligible for the return policy, the manufacturers request the customers to follow the rules that make them eligible. The customer reviews that are given on the product’s website as well as on the other shopping websites are positive and give a good feedback. Hair Formula 37 combines the best of minerals and vitamins which help in the growth of hair and overall health of the hair, this product lives up to the claims it makes. The customer reviews are a proof of it and the instructions that are given should be followed carefully if one needs to get the best results. The manufacturers give a full refund and are willing to take the product back if it fails to satisfy the customer. Overall there are no downsides to using this product.